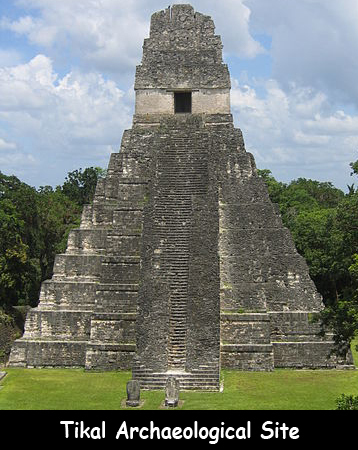 Tikal is an archaeological site which was one of the urban centers of the pre-Columbian Maya Civilization. It was the capital of a conquest state and which also became one of the most powerful kingdoms of ancient Mayans. It was the most prosperous city of that period. It is located in the Peten Region of Guatemala, deep within one of Central America’s largest rainforests. It covers an area of 575.83 square kilometers. Tikal National Park was the first protected area in Guatemala. It was created in 1966. It was declared as a UNESCO World Heritage Site in 1979. The Peak population of this region was approximately 100,000. By 900 AD, this Mayan city had been abandoned, nobody really knows for certain why this happened. Some experts think that the reason might have been overpopulation and resource depletion. A few buildings in this region date back to the 4th century BC. The geographic region known as the Peten Basin covers the northern part of Guatemala. The first European to have ever seen this ancient city was possibly the Spanish friar Andres de Avendano in 1696. The ruins of this city were discovered officially for the first time in 1848 when an expedition sent out by the Guatemalan government. Tikal is dominated by five main temples which are commonly referred to as Temple I to V.
Temple I is the most famous structure of this national park. It rises 50 meters above the plaza’s eastern end. This national park is home to at least 54 different species of mammals and 333 species of birds. Declan, Tobin. " All Facts about Tikal for Kids ." Easy Science for Kids, Apr 2019. Web. 25 Apr 2019. < https://easyscienceforkids.com/tikal-facts/ >.